Springfield native John Legend is a critically acclaimed, multi-platinum selling singer/songwriter known for his dedicated work as a philanthropist and social activist. 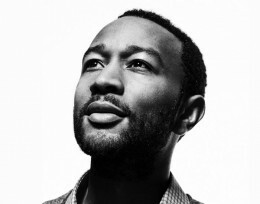 Nine-time Grammy award-winning musician and philanthropist John Legend will be the keynote speaker at the Wright State University 2012 Freshman Convocation on Friday, August 24. Legend will also perform 2–3 songs at the event. Freshman Convocation is a formal assembly of Wright State University’s president, provost, deans, faculty, staff, new students and parents who convene for the purpose of welcoming, celebrating and recognizing the newest members of the Wright State community, the Class of 2016. The event will begin at 3 p.m. at the Wright State Nutter Center and is free and open to Wright State faculty, staff and students. Shuttles will provide transportation from the Student Union and campus residence halls beginning at 2 p.m.
Springfield, Ohio, native John Legend is a critically acclaimed, multi-platinum selling singer/songwriter known for his dedicated work as a philanthropist and social activist. He has won nine Grammy Awards, two NAACP Image Awards and was named one of Time Magazine’s 100 Most Influential People. His albums Get Lifted, Once Again, Evolver and Wake Up! all debuted at the top of the charts and have demonstrated his musical talent as an artist and performer. Legend has collaborated with artists including Kanye West, The Roots, Andre 3000 and Common, and performed with The Black Eyed Peas, Alicia Keys, Lauren Hill and Jay-Z. Legend has aspired to make a difference in the lives of others. In 2007, he launched the Show Me Campaign, an initiative that uses education to break the cycle of poverty and ensure that every child has the opportunity to shine. He sits on the Boards of Teach for America, Stand for Children and the Harlem Village Academies and co-chairs the Harlem Village Academies’ National Leadership Board. Legend serves on the Advisory Council for Turnaround and is an “IRC Voice” for the International Rescue Committee. He is also the national spokesperson for Management Leadership for Tomorrow, a nonprofit organization that assists the next generation of minority business leaders. Legend partners with electronic-manufacturer Samsung to support education initiatives, with a special focus on the STEM disciplines (science, technology, engineering and mathematics).